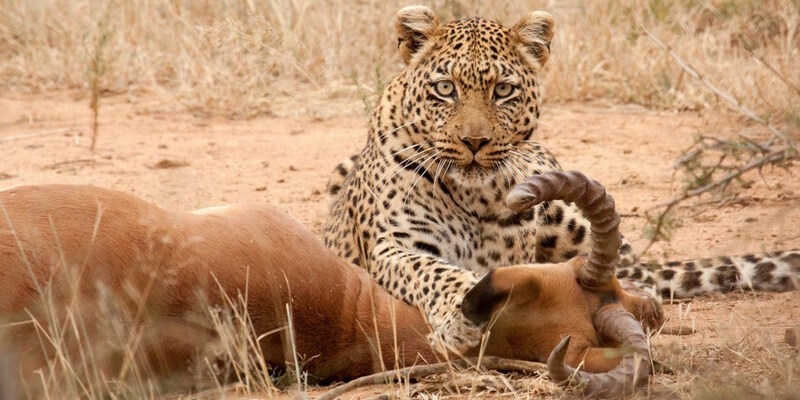 Our 3-day Camping safari Tanzania is the best you can take if you are looking for a ‘no-frills’ budget safari in Tanzania but still enjoying all the wildlife and game watching opportunity that you can get in the shortest time possible. 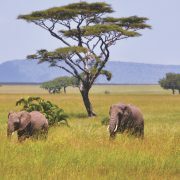 This 3 days safari in Tanzania takes you to some of the best national parks in the Northern Tanzania Safari Circuit including a visit to Tarangire National Park, Lake Manyara National Park as well as the Ngorongoro Crater which is UNESCO World heritage site and one of the best wildlife areas in Africa and the whole world. 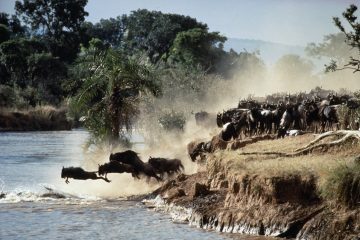 3 day Tanzania Camping Safari Where to Stay? Tarangire National Park has several campsites inside but they are seldom used because clients on safari in Tarangire National Park would rather spend the night in better established camping grounds just outside the park or even at Mto wa Mbu closer to Lake Manyara National Park if going that way the next day on a longer camping safari in Tanzania. Our package is no exception and you will either spend the night at a campsite just outside the Tarangire National Park (especially if you wish to do more game drives early in the morning ( at extra park entry fees cost), or you can simply spend the night at a nice campsite at Lake Manyara like the Migombani Campsite or the Panorama Campsite or Lilac Campsite Fanaka Campsite at Mto wa Mbu. 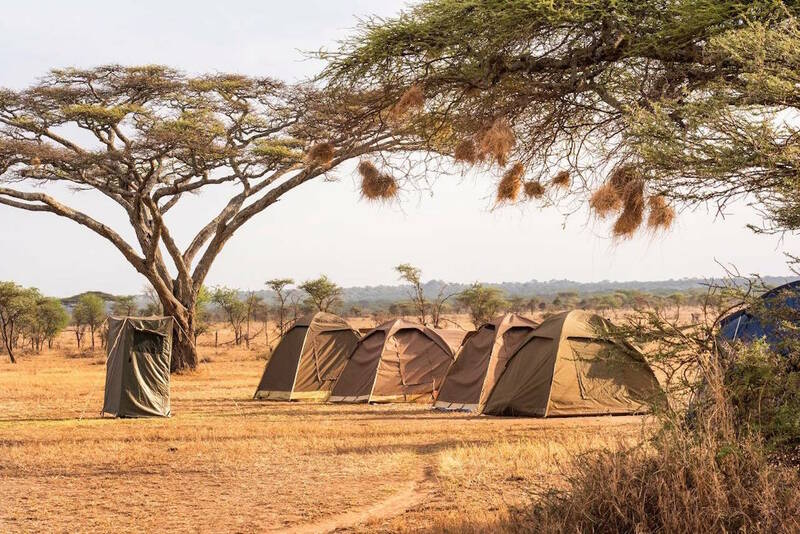 Apart from the campsites at Mto wa Mbu and at the park boundaries of Tarangire one can stay at the Ngorongoro Simba Campsite which is located at the edge of the famous Ngorongoro Crater with nice view over the Crater floor. Please request for a quote for staying here. 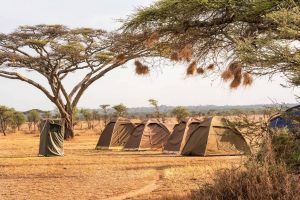 The 3 Days camping safari in Tanzania including a visit to Tarangire, Lake Manyara and Ngorongoro Crater offers you a chance to see a lot of wildlife and birdlife in the course of that shortest period. 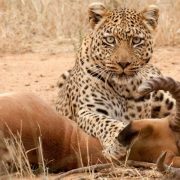 In fact it is the most rewarding short safari in Tanzania because you can with very little luck spot all the Big 5 including Buffaloes, Elephants, Lions, Leopards and Black Rhino. Apart from the Big 5 opportunity you can spot a lot of other animals including giraffes, zebras, impalas, gazelles, did diks, warthogs, hartebeests, even gnus in the Crater floor, hyenas, cheetahs, serval cats and many many more. With the visit to the Crater’s floor and Lake Manyara you will also have a chance spot a lot of aquatic and non aquatic birds including some of the rare species than can be spotted in Tarangire National Park only. 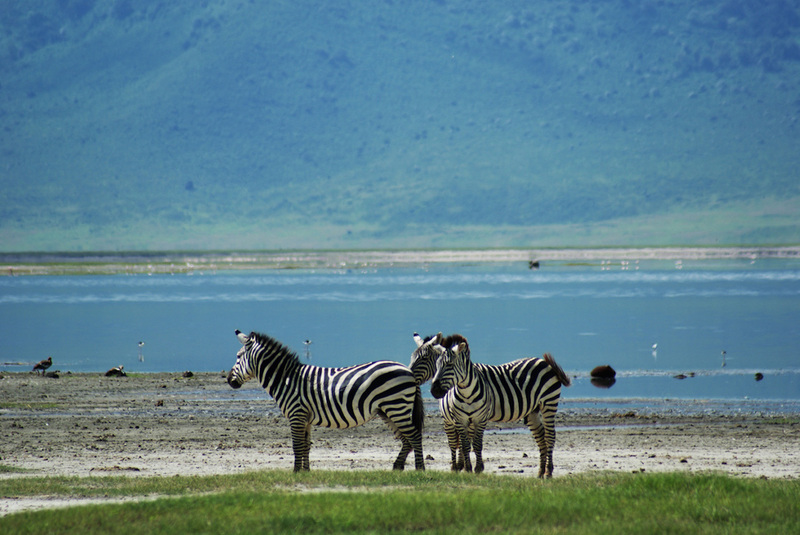 Pick up from Arusha early in the morning and drive for around 2 hour along a nice paved road to Tarangire National Park which is along the way when you take the Arusha – Dodoma Road; past Makuyuni Junction. 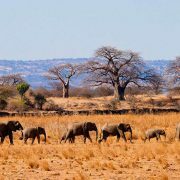 Tarangire National Park is the place to be if you want see elephant herds in their big numbers as well as other big game and birdlife. 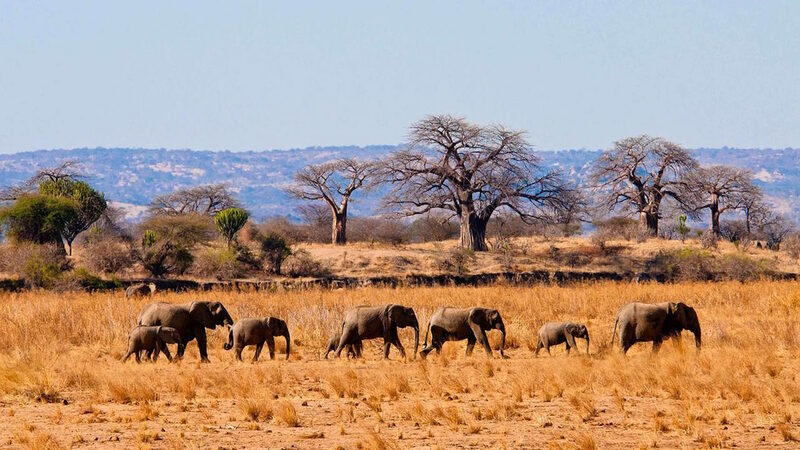 Dotted with gigantic baobab trees the Tarangire National Park is one of the parks where you can see most of the big five including the leopards, Buffaloes lions and elephants with one exception of the Rhino. The park derives its name from Tarangire River which flows across the park ensuring the park is teeming with wildlife throughout the year. You will do game drives until later in the afternoon then transfer to Mto wa Mbu where you will spend the night at a campsite at Mto wa Mbu near Lake Manyara. Lunch and dinner included. This morning we will wake up very early in the morning and transfer trough Karatu township arriving early at Loduare Main Gate of the Ngorongoro Conservation Area where you will register to access the NCAA. You will make a brief stop at the Crater’s View point where guests are allowed to alight from the jeeps and have some great views over the Crater floor and an opportunity to take some pictures before descending to the Crater floor where most of the animals reside. You will to day spend the most of the day at the base of the ‘World largest Caldera’ doing game drives in a bid to spot all the Big five as well as many other animals that can be spotted at a very close range in this area. 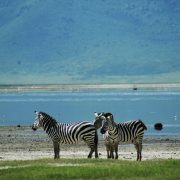 Ngorongoro Crater boasts of the largest concentration of wild animals in their natural habitat. Lunch will be picnic lunch at one of the picnic sites, and later in the afternoon you will drive up the Crater rim where you can camp at Simba Campsite or returned to Mto wa Mbu where you will check in again at your campsite. Request for the price to stay at the Crater’s rim if you wish. All meals are included. Breakfast, Lunch/lunch box and dinner. Breakfast at your campsite freshly prepared by your professional trained safari cooks then you enter the Lake Manyara National Park at the base of the Great Rift Valley which runs from North to South Africa. The 3rd and last day of your safari will be spent at this small gem of a park which constantly lush green with leafy green forests that are fed by underground rivers making it a very beautiful park regardless it’s size. You will do game drives in the few plains inside this park while elephants and giraffes can be spotted as you pass the forests right from the park’s entrance. The park is also home to thousands of primates including cheeky monkeys and large troops of baboons that reside in this wildlife park. The lake itself makes up for two thirds of the park (220 Km Square) and at the shores of the lake you will see a lot of hippos as well as aquatic birds like cormorants, Egyptian geese, herons , as well the Greater and lesser flamingos that flock in this lake. 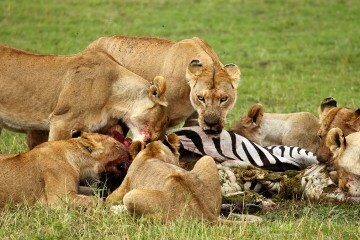 Later in the afternoon depending on your schedule you will be transferred back to Arusha where your safari ends. 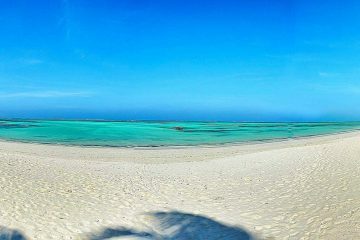 If you wish you can go for a beach extension if you want to combine your safari with beach just like the packages that we have in our Tanzania safari and Zanzibar Beach packages. Please let us know and we will customize your program accordingly.